Global trend forecasting authority WGSN has collaborated with Cosmoprof Worldwide Bologna to create a new installation for Cosmopack - hall 20 - showcasing the next colours and innovative materials for beauty packaging in 2021. 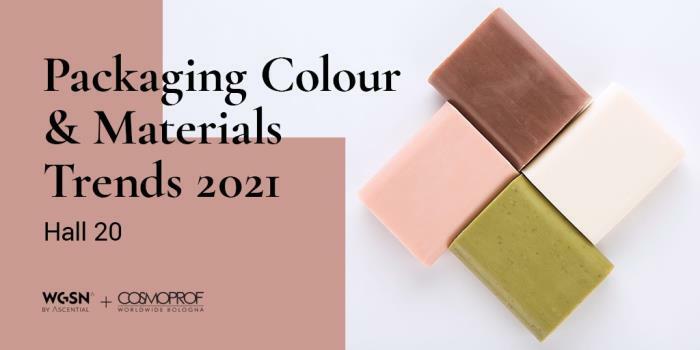 There will be a greater focus on sustainable tones in 2021, with colours that can be produced with less harm to the environment as well as colours that have trans-seasonal appeal. WGSN have selected 12 key colours forecasted by their global experts to be the essential tones for the season and 7 must-have material innovations and trends for the beauty packaging sector. A key colour from WGSN’s S/S 20 forecast and evolving on from the soft pastels, such as Millennial Pink, which has been extremely popular, Neo Mint will continue as an important tone in 2021. These 12 colours will be displayed on large flags, suspended from the ceiling, and will feature both Pantone and Coloro codes. Alongside the flags, the installation will also present 7 key material trends for the beauty packaging industry in 2021. It will showcase the must-have materials, finishes and surface patterns as well as new concepts and applications to inspire new beauty packaging development. Resource scarcity will put pressure on the beauty industry to look for alternative, eco-conscious regenerative and bio-degradable packaging. Exciting innovations will see living organisms and matter “grown” into new materials and natural, food-derived bioplastics transformed into new materials that will increasingly up-scale to offer a more sustainable solution to ubiquitous, single-use plastic. ARE YOU READY TO DISCOVER THE FUTURE OF THE SUSTAINABLE BEAUTY? The 2019 edition of Cosmoprof Worldwide Bologna has come to an end. The event continues to grow, and the results confirm that it is a landmark event exhibition for the entire beauty industry, welcoming over 265,000 cosmetic beauty professionals and a record number of 3033 companies as exhibitors. The world's busiest conference program in the beauty universe is back for the third year with a packed schedule of educationals, 2 stages and 25 high-level partners. 150 opinion leaders belonging to all sectors of beauty industry and from the most important trend agencies, but also from media, design and tech, will explore the newest trends, beauty innovations and technologies for all beauty sectors. Thanks to the work of ProChile, a leading public organization that promotes the country’s local businesses abroad, Cosmoprof Worldwide Bologna will present the Chilean country pavilion in hall 21, which historically has been dedicated to the world of nature. Cosmoprof Worldwide Bologna is offering beauty professionals the best of the hair industry in halls 25, 31, 32, 35 and 37, with the world of beauty and spas to be featured in the new area in halls 28, 29 and 30, and nails in historic hall 36. The 20% increase in exhibition space perfectly represents the growth being seen in the beauty and spa area, with an additional increase in the number of companies from of hair sector—companies that are ever more sophisticated and innovative. What's new for the beauty, hair, spa and nail industries? For over 50 years, Cosmoprof Worldwide Bologna has been the go-to show for the most important companies and professionals in the beauty, hair, spa and nail industries. These four days allow visitors to meet with the brands that have made history in the beauty world and discover the up-and-coming names that have chosen this show to make their debut to the world. The main topic of the next edition of Cosmoprof Worldwide Bologna is sustainable beauty, with no compromise. From packaging to formulas, from the research for natural ingredients to policies chosen by companies with enlightened managers. Thanks to specific projects and special areas dedicated to these themes, Cosmoprof is the proof that today the focus is on beauty products providing a true self-care sensorial experience. Consolidating its position within the key markets and laying the foundations for new common projects is the new strategy decided upon by BolognaFiere Cosmoprof, part of BolognaFiere group and organizer of the events of the international Cosmoprof network, and the Health and Beauty group, leader in trade magazines and events for the professional beauty in Europe, following the acquisition which has been closed in the latest months. Cosmoprof Worldwide Bologna is strengthening its presence in the key markets for the beauty sector. In addition to hosting events in Las Vegas (Cosmoprof North America), Hong Kong (Cosmoprof Asia) and, from September 2018, Mumbai (Cosmoprof India), the brand has sales international agents in Colombia, in Belleza y Salud, and in b2b beauty trade shows in South East Asia, to increase the commercial exchange between local companies and international buyers and distributors. The men’s cosmetics market is at a very important juncture. An increasingly important player worldwide for many years, after a period of slow but steady expansion it is currently expected to grow faster than any other cosmetics sector between now and 2020. Cosmoprof Worldwide Bologna, which has always been a hub and a trailblazer for international trends, has already identified new products among the exhibitors at the next edition that are bound to become the new must-haves for end consumers. An agreement has been reached between BolognaFiere Cosmoprof, organizer of the events of the Cosmoprof platform in the world, and Beauty Fair - Feira Internacional De Beleza Profissional, the event in Sao Paulo, Brazil, for professionals and distributors of the local cosmetic industry. Cosmoprof Worldwide Bologna, the leading B2B exhibition in the world for the beauty industry, announces a new look for the 2019 edition. Over 250,000 professionals from all corners of the globe come to Bologna to discover cutting-edge technologies, innovative products, and eco-friendly proposals of the future. After the positive feedback of last year, Cosmoprof 2019 is confirming the different opening dates, according to each professional target. 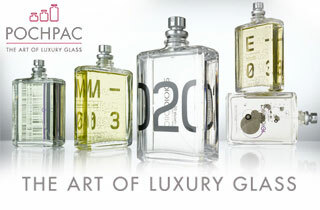 From Thursday 14 to Sunday 17 March 2019, Cosmopack and Cosmo|Perfumery & Cosmetics will open, facilitating business meetings between suppliers and manufacturers on the one side, and companies of finished products, buyers and retailers on the other, with a focus on Perfumery & Cosmetics, Green & Organic and Cosmoprime, the area dedicated to haute gamme perfumery. Cosmoprof Worldwide Bologna presents the new advertising campaign for the next edition, which will take place in Bologna from 14 to 18 March 2019. The new image, conceived and curated by Heads Collective, will promote the events of the Cosmoprof network - Cosmoprof Worldwide Bologna, Cosmoprof North America, Cosmoprof India and Cosmoprof Asia - on the main national and international media.